← Huddle Gridiron Tip of the Day: Collect Points Cards or Collect Inserts? Here we are. We can see the finish line for the original week one marathons, and it is glorious. Vintage is the first of the seven sets to be completed, and it is one I have collected since Han in the Millenium Falcon hit packs over 30 weeks ago. I cannot believe it has been that long, as this has been one wild and fun ride. With production delays impacting all the other sets, some of them might not finish for a few weeks now. Even though that is the case, its clear that the original days of the app are coming to a close in a way that we havent really been prepared for as a community. Marathons have been a part of our daily lives for the better part of a year now, and I am curious to see what might happen when the last of the original sets end. Galactic Moments should end up being the last one to finish with all the delays and variants, so that isnt as high a priority right now. If you have yet to get your copy of Obi Wan WV or the ever elusive Vintage Han, you might be out of luck. Adding in that the Luke Preps for Battle Vintage only has 1250 copies is also a tall task, but it can be done. Widevision as a whole has dropped in value significantly over the last part of the marathon, but people still attach that residual value we have seen thanks to the aura around the wave one cards that are so tough to get. Connections and Topps Choice are almost neck and neck in my opinion as the 3rd most valuable set, especially with how much some of the wave one Topps Choice cards go for. Wicket, Sabine, and other card values are enough to offset the cost of the Sith Connections card for Maul and Sidious, as many of the rest of the connections cards are interchangeable even going back to wave 2. The Han / Chewy and Han / Leia cards are tough to get, but higher counts without much dead account attrition should make them still available. I think that this question is one that I have yet to really figure out. Its entirely possible that they just start all over with week 31 and do another 30 cards, but that isnt like them. We could end up being in the relative “offseason” for SWCT, with a primary focus put on Smuggler’s Den and Build Mode as the Marathons go away. We could also see them launch seven NEW marathons, which might last 10-20 weeks before we could go into a SWCT season 2 type of situation. Eventually a new year of the app with a new build will come. As Bunt 2016 kicks off the new year for Topps Digital, I foresee that this app should get an upgrade at some point as well. It obviously wont be the same thing as the sports apps, but im curious to see what eventually happens. There is no doubt in my mind that I want daily marathons to chase. 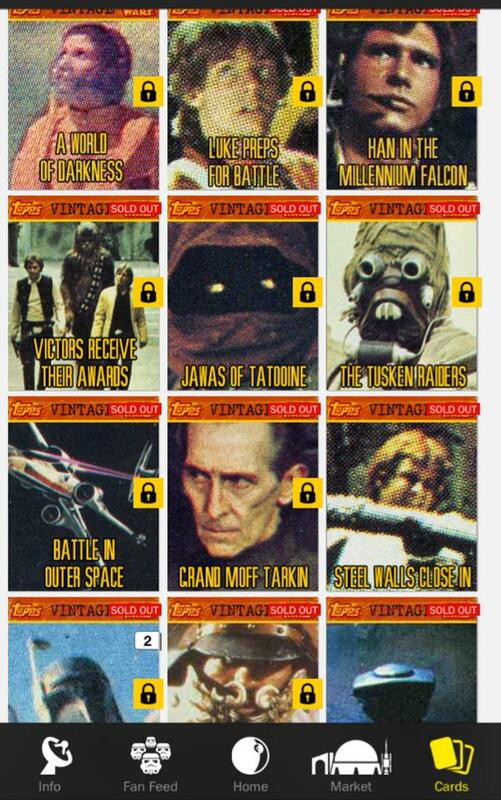 Similarly, I dont want the sets like Vintage and Widevision to “end.” Does that mean we should prepare our SWCT consciousness to exist without these sets? Maybe. At some point in the future we will get to see what their plans look like for the next few months of the app. I am hoping that with the release of Force Awakens and other big events, we will have an opportunity to see the frenzy created when the original Marathons earned their stripes.